I can vividly remember being out for drinks with Elsie and Emma about a year ago and hearing them order a drink that was unfamiliar to me—a Moscow Mule. I had no idea what the drink actually was, but the name intrigued me, and once I saw it brought to them in the shiny copper cups, I really had to know what this drink was. Thankfully, they are totally the kind of happy hour companions that let you try their cocktails, and it only took one sip of the sweet ginger drink to hook me. We’ve done a few twists on the classic cocktail here at the blog, but when I saw this Moscow Mule jello shot, well, let’s just say the word “genius” came to mind, and I was driving to the grocery store for ingredients before I even knew what was happening. I mean, hello, it’s two of our favorite things combined! Squeeze 1-2 limes to get your lime juice and add that to a small saucepan with your ginger beer. Sprinkle the unflavored gelatin on top of the liquid (don’t stir). Allow the gelatin to sit for 5 minutes. The gelatin will turn into a rubbery film on top. Turn the burner on to low-medium heat and stir until the gelatin dissolves. Be careful not to let it boil! Use cooking spray or oil to lightly grease a silicon ice cube tray (wipe up any excess with a paper towel). Pour the vodka into a glass measuring cup or other container with a spout, add in the lime/ginger beer liquid, and stir to combine. Pour the liquid into the ice cube tray and place it in the fridge for at least 4 hours until set. Squeeze 1-2 limes to get your lime juice and add that to a small saucepan with your ginger beer. Sprinkle the unflavored gelatin on top of the liquid (don't stir). Allow the gelatin to sit for 5 minutes. The gelatin will turn into a rubbery film on top. Turn the burner on to low-medium heat and stir until the gelatin dissolves. Be careful not to let it boil! Push your jello cubes out from the bottom side of the tray (slide a knife around the edges as needed), and you're ready to serve! I love the cubes presented in Moscow Mule copper cups, so I would suggest that as a serving vessel if you have them (or it's just another excuse to buy some if you don't!). This is… I am speechless. My favorite alcohol drink has been turned into a jello shot, and I couldn’t be happier. You are totally amazing. Yumm!! This looks so delicious!! This is right up my street! I Love a Moscow Mule.Really need one of they mugs in my life. Ooh these sound so good. Might have to try this recipe for a paint nite party soon. I love all your jello shot recipes. As a vegetarian, however, I am hesitant to use gelatin. I’ve heard using agar-agar flakes as a substitute; have you ever tried that? Haha! Laughing at Elsie’s comment to Emma. These look so good! Will have to try. I learned about the Moscow Mule at the Standard Hotel in NYC. We immediately purchased the tin cups online and started making them at home (and chilling the cup beforehand) – Deelish. And now this. WHAT! I’m a forever young baby boomer and the daughters are all millenials and home for the weekend SO NOW I WILL BE COOLEST MOM on the block with my girls this weekend serving up my favorite drink their style! thank you. I love this idea! 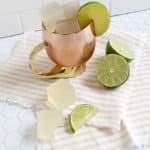 Moscow Mules are delicious and I’m sure they would be even more delicious in a jello form! Thanks so much for sharing! Awsm. These Jello shots look so yummy.